I went on my first elk hunt in 1976 with some friends. We’d decided that we’d travel to Colorado and have a do-it-yourself elk and mule deer hunt. 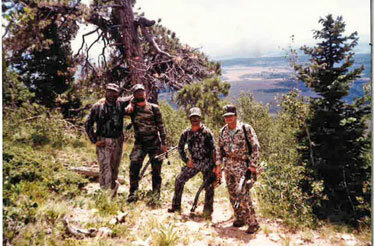 None of us had ever been elk hunting before, and we didn’t know what we were doing or how to hunt elk. Six of us were on the trip, and we camped out on public lands. Only one of our hunters took a mule deer, and no one took any other animal. But that was one of the most fun trips I’ve ever been on in my life. I learned from that trip that harvesting an elk was not the main reason to go elk hunting. An elk would have been a bonus in my opinion. On that first trip, I realized that elk hunting was a new world like nothing I’d ever seen or done before. We saw lots of critters and met other elk hunters. I realized I wanted to hunt elk the rest of my life. This hunt took place in the period of time when outdoor magazines were the only way hunters could learn about hunting. There were no outdoor videos or television. “Field and Stream,” “Outdoor Life” and “Sports Afield” were about the only magazines we could buy in Mississippi about hunting and fishing, and where we could see pictures of hunters standing on mountainsides, holding binoculars, looking over a vast mountain range for elk. I felt elk hunting was something I had to do before I died. I also liked the idea of trying to call in elk. I thought to myself, “If those guys can do it, I can too.” However, my buddies and I were unsuccessful on our first two trips to the western mountains to hunt elk. On that first hunt, we arrived in Colorado the day before elk season started. Although in my late 20s back then, I wasn’t in great shape. With all the hiking I did on that first trip, every now and then I’d get short of air. After that first day of scouting, I woke up in the middle of the night with the worse headache I’d ever had and also a nose bleed. I think I was suffering from altitude sickness. After three days, I was better acclimated to hunting high mountains. Since that time, I’ve been on about 30 different elk hunts, mostly while carrying a video camera instead of a rifle or a bow. I’ve only harvested four elk because most of those elk hunts I was on I was videoing someone else taking an elk. But the first two elk I harvested were on public-land hunts. In the mid-1980s, I was working for Will Primos of Primos Hunting as his cameraman. Back then videoing an elk hunt was an ordeal. I carried one of those big TV cameras, batteries and all the equipment I needed to film the hunt, and my pack weighed just a shade under 90 pounds. The batteries weighed three to four pounds each, and I had to have five or six of them to use each day we were in the mountains. We were shooting a 3/4-inch camera that had a cord that hooked to a recording deck. I was carrying an insane amount of weight to do my job. Those hunts were brutal. I’d always be the last guy to reach the top of a mountain. No one could know what carrying that much weight all day long felt like, unless you did it. I remember climbing a mountain with Will. When we had gone about two-thirds of the way to the top of the mountain, I set the camera down and put the frame pack with the tape deck on it and the batteries down on the ground. Will thought that was the funniest thing he’d ever heard. I have eaten fried pork chops since, but I’ve talked to God about it, and He’s okay with it. Filming elk hunts was very painful back then. But today with lighter, better cameras and batteries with a longer life, filming an elk hunt isn’t nearly as tough as it was back then. When we got back to camp that night, I don’t think I even ate supper. I was so worn out I felt like I had the flu. I could only compare the feeling to how I felt after the first two days of spring football practice when I was in the 10th grade. I was beat up and sore. I never became accustomed to being from Mississippi and carrying that heavy pack in those high mountains of Colorado. However, once I heard an elk bugle, I forgot all about the pain in my legs and my back. After I put the last limb on this really cool blind, I used my range finder to check out the distance I might have to shoot, if a bull elk came in to where we were. I picked up binoculars and glassed the edge of this lake. I nearly fell over I was so surprised. I spotted another hunter on the other side of that lake sitting in a tiny blind. He apparently had watched us build that elaborate blind for 2-3 hours and never said a word. When I saw him, I said, “Well, good lord,” turned around, tore down the blind and went back down the mountain. However, on the last day of that hunt, I did take a legal raghorn 4x4 elk. We’d heard a bull bugle. We attempted to work our way up this mountain to him. On the way to the bugling elk, I saw an elk’s body off to the right of the trail we were climbing, coming down the same trail we were climbing, and the wind was coming down the mountain. I realized the bull wouldn’t be able to smell me. I stepped off to the side of the trail and got ready. The trail we had been on went up about 40 yards up the mountain and turned back to the right. Before the bull came around that sharp turn, I spotted his antlers and knew he was a legal bull. When I used my rangefinder to determine my distance from the point where the elk would have to turn to stay on the trail, I realized my shot would be about 50 yards. Since I’d been practicing shooting my bow at more than 50 yards, I felt confident I could make that shot. Once the bull reached 50 yards away, I put my 50-yard pin on him and aimed somewhat low. I released the arrow and thought I saw the arrow fly over the elk’s back. My feelings were hurt, and I was very disappointed. Before I’d released the arrow, I’d felt very confident about the shot. However, I saw the arrow on the back side of the elk. Because we were videoing the hunt, we spent about an hour recreating the shot and everything that happened, leading up to when I released the arrow. Once I reached the spot where my arrow had penetrated the ground, I saw blood everywhere. I looked back in the direction the elk had run after taking the arrow, and I spotted a huge blood trail with the elk on the ground. The arrow had center-punched that elk, but because of the angle of the shot, I’d come to the conclusion I’d missed him. So, when I got close to my elk, my knees got weak. That hunt remains one of my most treasured memories of any hunt ever. I’d taken my first elk ever on public land with my bow and arrow. I’d never had a bigger thrill in my life than when I reached that elk and saw him lying on the ground. After I got over the thrill of taking my first elk, my cameraman and I decided to take all the camera gear down the mountain. Then we’d have to make about three trips to carry out my elk. Once we reached the campground, I met a guy on a four wheeler, who offered to help us pack out the meat. We climbed back up the mountain with the man on the four wheeler and loaded that four wheeler down with meat. So, we only had to make two trips instead of three. I gave the four wheeler guy a hindquarter of that elk for being so kind to help us. I’ve been fortunate enough to hunt with some great people all my life. But my most memorable hunt with a celebrity was one I went on with the comedian Jeff Foxworthy. That was the first time I’d ever been in camp with him and away from everybody and everything. You really can get to know a person when you’re away from the glitz and the glamour and just be one-on-one. What I learned about Jeff was what a wonderfully nice, down-to-earth, country boy and human being he was. Many of us often think, “Boy, I’d like to meet that guy or lady, and find out what kind of person he or she really is,” when we see great athletes or people on TV and in the news. But sometimes when we actually do meet them, we’ll have a big letdown. I spent about eight days in Utah with Jeff, and I learned just what a hard-working guy he was who loved to hunt. Since I got to hunt on that trip, and I took my bull elk before he took his, I was able to interview him and hunt with him for a couple of days. That trip was the best I’d ever taken. He took my bow back to his shop, and I went with him to see what he was doing. The first thing he did was take the limbs off my bow and put different limbs on it than what I had. He also recabled my bow, shot it and dialed it in for me. What impressed me was that Pete took the time out of his busy day to help me have a bow that would shoot better than the bow I’d brought with me. The bow was a PSE EVO, and Pete signed the bow with his name. I decided right there that I was hunting with that bow until I was too old to hunt with a bow. That’s the bow I arrowed my elk with on my Jeff Foxworthy hunt. The bull I took was the biggest I’ve ever taken – right at 300 inches. If I’d held out longer, I probably could have harvested a bigger elk. But I had a video guy with me who’d been climbing in those mountains for two days. This bull came from 150 yards away and walked all the way through a beautiful meadow. My cameraman whispered, “Cuz, we’ve got to shoot this one.” So, when the bull was at 35 yards, the bull was facing me. After what seemed like forever, the bull turned to leave and gave me a broadside shot. I took it. Once the elk took the arrow, he ran off to about 80 yards and fell on camera, which was a rare occurrence to get an elk going down. Jeff Foxworthy’s elk was bigger than mine by 30-40 inches. When I’m filming an elk hunt, each person on the hunt with me has a specific job to perform. The caller is about 60-70 yards behind me and the hunter. His job is to get the elk to walk in front of the hunter. My job is to set up right on top of the hunter and see everything the hunter sees. 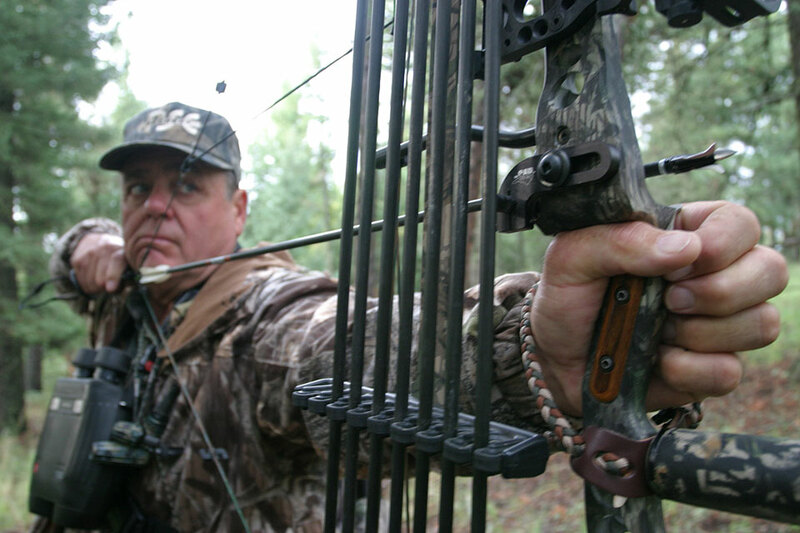 The hunter’s job is to take the elk with his bow when the elk presents the shot. As long as we all play our roles on the hunt, we have a much greater chance of filming a quality TV show or video. I really enjoyed learning how to call elk, which was much like calling turkeys. Once a person knew how to manipulate a diaphragm turkey call, he or she easily could use a diaphragm to call an elk. However, when I was videoing hunts, I’d get 60-70 yards behind the person who was going to take the elk, and I used a Primos Hunting Hoochie Mama to call to the bull. I noticed that elk were much like turkeys and got excited and tuned in to where that cow elk sound was coming from. What I try to do when I call elk is to call the elk past the hunter. So, when I’m filming an elk hunter, I don’t make a sound. I can’t say that I’ve ever called in an elk by myself, because most of the time I have that camera right over a hunter’s shoulder. I have bugled to elk and had them answer me. However, when we’re filming someone trying to take an elk with a bow and arrow, we’ve had someone else doing the calling so I can sit tight with the hunter. I never let my ego get in the way of trying to help other people be successful on elk hunts. My job always has been to get the best video I can of the elk, the hunter and the shot. So, I’ll generally let someone else do the calling. I’ve learned from filming elk that when a bowhunter is trying to take an elk, his attention is so focused on that elk and getting the shot, he forgets about the caller and the videographer. In 30-plus years of hunting elk, I’ve taken four elk on camera and probably filmed another 10 bulls being taken by other bowhunters. I got very excited. My family and I enjoy eating elk, and we’ve eaten every elk I’ve ever harvested. Our freezer at that time was completely empty of elk meat. I was excited to learn that Troy Ruiz, who had worked with Mossy Oak for a long time, was going with us to film the hunt, as was Lake Pickle, another cameraman who had filmed with us before. Jimmy insisted that I hunt first, and he would do the calling. We’d be hunting with rifles. We arrived, and I saw we were hunting on a beautiful cattle ranch where the cattle held down in the valley, and a mountain seemed to jump out of the valley floor. The elk were holding up in the mountains. Jimmy called this elk in to where I was from a long way off. The cameras Troy and Lake carried were nowhere near as large as the cameras I had to carry when I first started filming outdoors for TV and videos. Their cameras probably weighed 20 pounds each, as compared to the 80-plus pound cameras we once took afield. Some guys today even film TV shows with their cell phones. As the bull moved closer, he wouldn’t present a broadside shot. Once the bull was 45 yards or so away from me, he spotted something he didn’t like and wheeled around. I had backed my rifle scope down to about 3X before the bull wheeled. I was on him with my rifle. I put the bullet right behind his shoulder. The bull went 30-40 steps before falling over. Later on Jimmy’s hunt, we had Jordan “Big Country” Blissett calling. I’d taken my own camera gear that I used to film for Cuz 411. Once I took my elk, I went into what I’m most familiar with – my cameraman role. I’ve started filming many hunts for Cuz 411 and I think that’s the only elk hunt I have on the Cuz 411 YouTube channel. I filmed it in two parts. 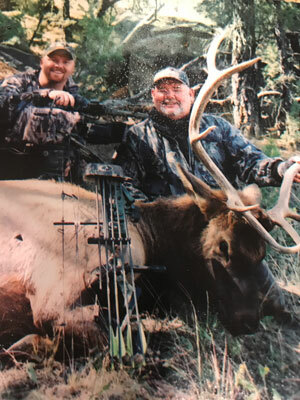 It’s listed as New Mexico Elk with Jimmy Primos. I also have my video on Facebook under Cuz Strickland and some videos on my Instagram account too – Cuz Strickland. Jimmy’s elk would score over 300 inches and was bigger than my elk. Jimmy took him at a much further range than I had shot. Jimmy was in the U.S. Marine Corps, so whenever he had rifle in his hands, he didn’t miss. I found a spot in a bunch of bushes where I could stand up and film the elk with my camera on a tripod as he came in to where I was. So, I got a lot of very good footage on that elk hunt. I strongly recommend that a first-time elk hunter get four buddies and all go in one vehicle with each contributing a certain amount of money to buy food and gas. Then if one of the hunters gets an elk, you’ve got plenty of help to pack out your elk. 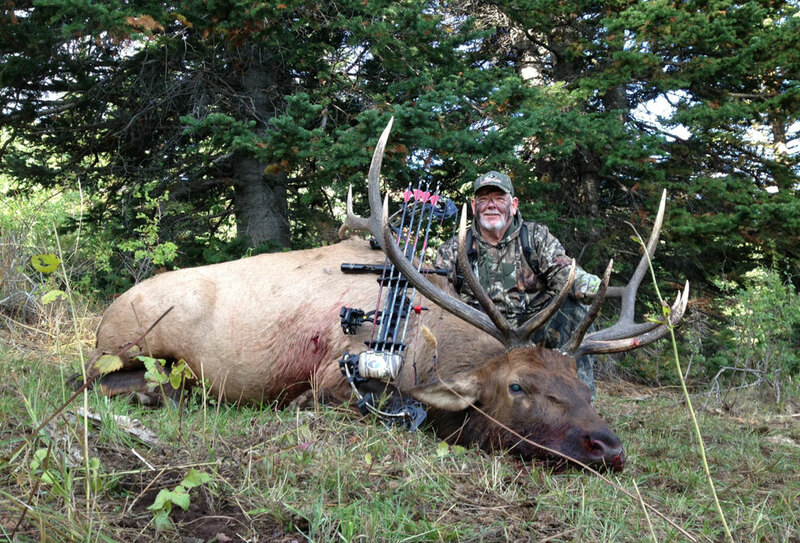 The second thing is don’t expect to take a 400-inch bull elk on your first hunt. More than likely, you ain’t going to take a bull that big. I don’t think most people on the eastern side of the Mississippi River realize how big and vast and scenic elk country is. You need to do research to find where most of the elk in the state you’re planning to hunt on public lands seem to be concentrated. Then you need to start pulling up onX Maps and Google Earth maps to see where you’re trying to hunt. On my first elk hunt, we took two vehicles, we switched off driving to keep from having to stay in motels, and we ate Vienna sausages, Spam and sardines in the car to save on food costs. But that was one of my most fun hunts ever. We camped out just like we knew what we were doing. For your first elk hunt – especially if you’re hunting with a bow – try to take a legal bull or get a cow tag and take one. 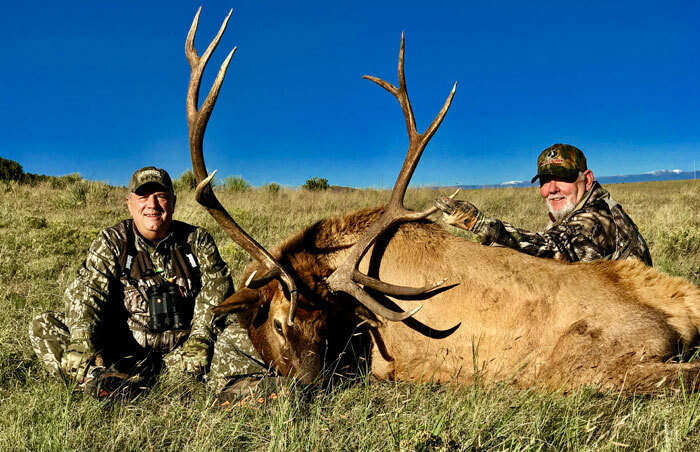 Every time you hunt elk, you learn more about how to do it and be successful. I think that team hunting with buddies is the most fun way to get into elk hunting. Make your expectations more about the adventure than about taking a giant elk. Welcome to our little patch of internet dirt where we go behind the scenes with Mossy Oak’s Cuz Strickland. He’s got how-tos, tips, tricks & the latest 411. We’re sharing hunting camp 365!